This chapter summarizes the findings of a study on robotics research and application for assisting children with disabilities between the years 2009 and 2013. The said disabilities include impairment of motor skills, locomotion, and social interaction that is commonly attributed to children suffering from Autistic Spectrum Disorders (ASD) and Cerebral Palsy (CP). 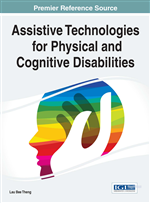 As opposed to assistive technologies for disabilities that largely account for restoration of physical capabilities, disabled children also require dedicated rehabilitation for social interaction and mental health. As such, the breadth of this study covers existing efforts in rehabilitation of both physical and socio-psychological domains, which involve Human-Robot Interaction. Overviewed topics include assisted locomotion training, passive stretching and active movement rehabilitation, upper-extremity motor function, social interactivity, therapist-mediators, active play encouragement, as well as several life-long assistive robotics in current use. This chapter concludes by drawing attention to ethical and adoption issues that may obstruct the field's effectiveness. Autism and Cerebral Palsy are known as some of the most prevalent congenital disorders among children. Autism is characterized by impaired communication and social interaction skills caused by neurodevelopmental disorder. Autistic children are also found bound to repetitive or restrictive behaviour (Mazzei, Billeci, & Armato, 2010). On the other hand, children with Cerebral Palsy suffer physical developmental disabilities characterized by motor function impairment. This causes problems to posture, gait, and muscle control across upper-body extremities, face, and so forth (McMurrough, Ferdous, Papangelis, Boisselle, & Heracleia, 2012). As far as is known at the time of this paper’s writing, there is no cure available for any of these conditions. In place of a cure however, rehabilitation is available to help restore or improve the physical functions of an afflicted child. These procedures usually involve a physiotherapist or equivalent professional, mediator therapy equipment and the patient as well as his or her guardian. As the number of patients may in frequent cases outnumber the availability of rehabilitation specialists, the use of rehabilitation robotics have been employed as an alternative to mediatory equipment. These assistive robots have been applied in controlled environments over the last two decades, and have had a hand at determining the adaptability of their patients’ physical capabilities, assisting in rehabilitation exercises as well as aiding in life-long support. Various techniques in the form of exercises are designed to gradually strengthen the patient’s motor capabilities or augment them in the pursuit of their daily activities, all involving the intervention of assistive robotics (Munih & Bajd, 2011). In the case of autistic children who may suffer from muscle atrophy due to inactivity or restrictive repetitive motions, and the motor function impairments of Cerebral Palsy suffers, rehabilitation robotics play an intricate role in improving mobility and gait, strengthening upper-body extremity motor functions, lower limb impairment treatment using passive stretching, and assorted task-specific training. It should also be noted that children suffering from autism and Cerebral Palsy are also subjected to social and communication skill impairment. Common problems associated with these two conditions include difficulty in engaging and continuing interaction with the presence other human beings, engaging in active-play and acquiring basic communication skills. Studies have shown that children with autism are more inclined to react to a humanoid robot than they would towards a human therapist (Colton, Ricks, & Goodrich, 2009). This has stimulated the development of robot mediators that come between the therapist and the child in the hopes of applying rehabilitation exercises that targets improvement of interaction and communication skills. The use of assistive robotics has not been adopted with fully open arms, unfortunately. Ethical issues concerning safety, usability and awareness has been a constant envelope surrounding current studies and experimental apparatuses, preventing widespread use. There are also concerns over the level of autonomy involved in assistive robots particularly in cases where the user may not be physically capable enough to prevent impending malfunction or accidents. Therapists in general are also not fully comfortable with the idea of rehabilitation robots operating without remote control, thus contributing to the resistance towards autonomy.